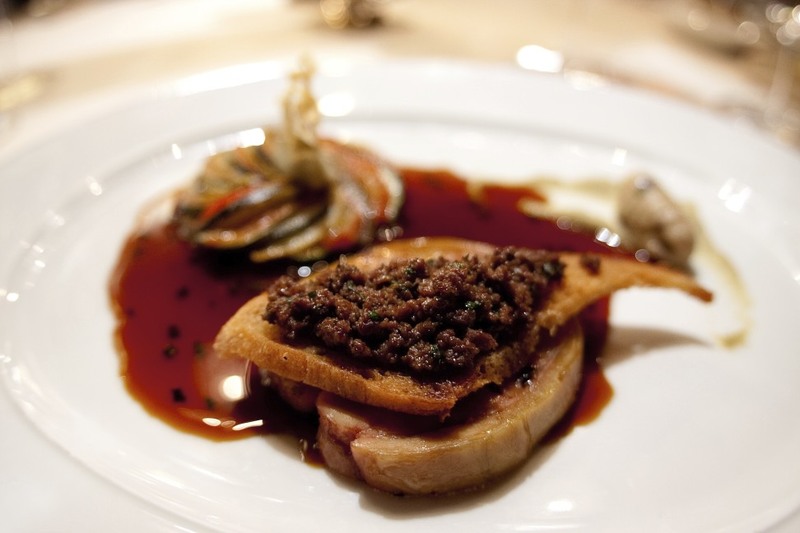 Ask any gastrophile about Paul Bocuse or Alain Chapel and I guaranty you that most of them will know about their legacy as pioneers and founders of Nouvelle cuisine in France. 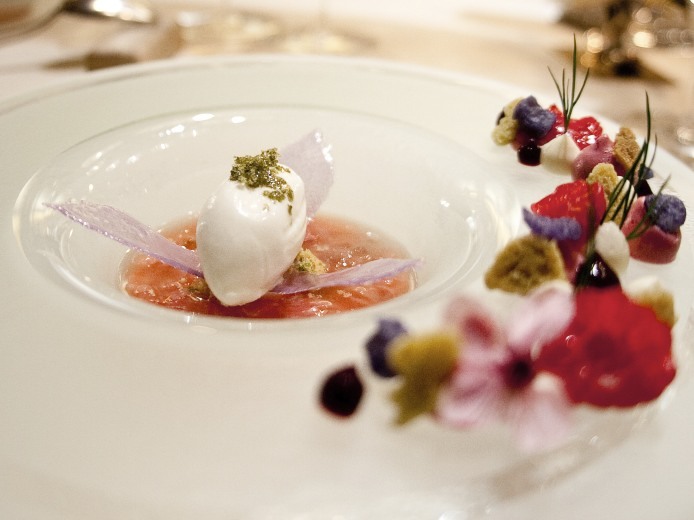 Just like Bocuse, Harald Wohlfahrt in Germany has paved the way in redefining the fine dining scene in Germany over the past three decades. Adding to his impressive accolades of three Michelin stars which he has kept since 1992 and a 19.5 scoring from Gault Millau, he has also single-handedly trained a staggering six of the current ten three-Michelin-starred chefs in the Germany at his highly acclaimed restaurant, Schwarzwaldstube, located in the heart of the Black Forest in the hotel Traube-Tonbach. 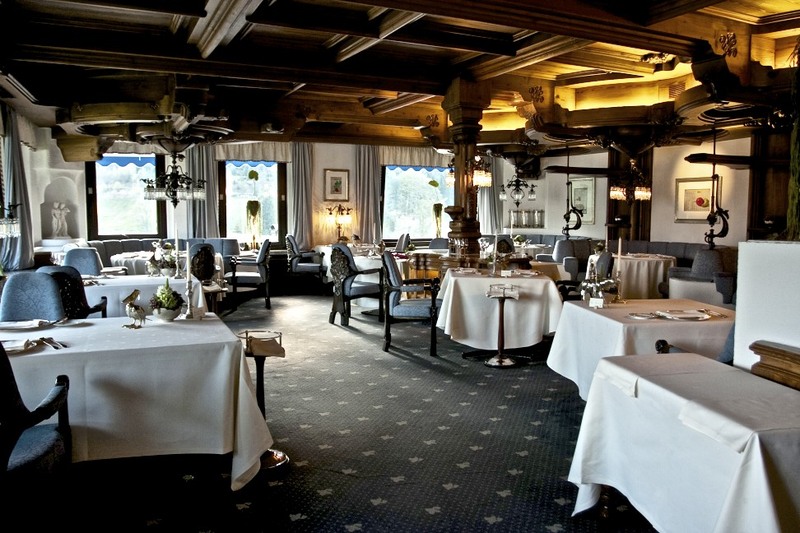 Given my limited fine dining experience in Germany, albeit very good thus far, I was very excited about my visit to the Black Forest with Fine Dining Explorer and a couple of other friends. As we pondered over the choice of wine with the sommelier, an array of amuse bouche arrived at our table. We were advised to start from the left with the chip made from tapioca and skin of soft shell with crab. The crab was very flavoursome although the tapioca very subtle. 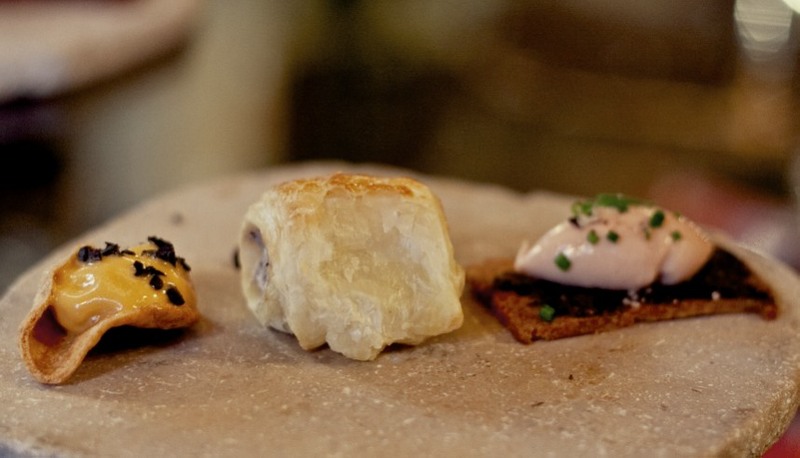 In the middle was a puff pastry with guinea fowl mousse and truffle, which had a very delicate flavour, although I found the content inside resembling more to that of a liquid than a mousse. Lastly on the right was a rye bread chip with Perigord black truffle butter and foie gras on top. It was the tastiest of the three and certainly had the most distinct flavour. The rye bread was crunchy and the black truffle was of a very good quality, adding earthiness to the delicious foie gras. … of a Variation of Char from Oberpfalz, a freshwater fish related to the trout family. We started with the Char with kataifi and salad of carrot, coriander, ras al hanut and caraway seeds in the front, followed by Char with Compté cheese and olive salad with kumquat to the right. On top was the tartare of Char with grains of beans with a crispy potato garnish, which was amazingly fresh and perfectly seasoned with the salty Char roe, finished off with a nice crunch from the potato. Lastly on the left we had the terrine of tomato and mousse of sturgeon surrounding the Char. The creamy mousse and tomato was refreshing and almost tasted like a gazpacho. It was as delicious as it looked beautiful. Good start. The next wine to match our meal was a bit of a surprise. 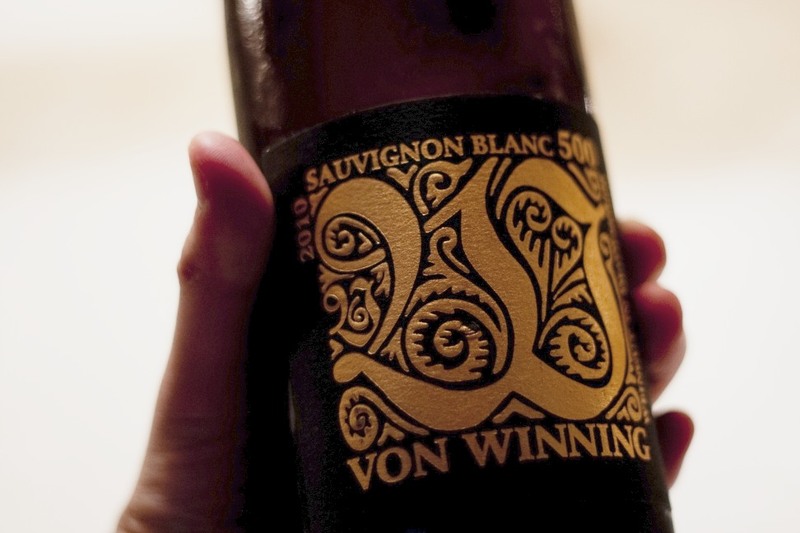 The sommelier insisted we try the Sauvignon Blanc 500 Von Winning. 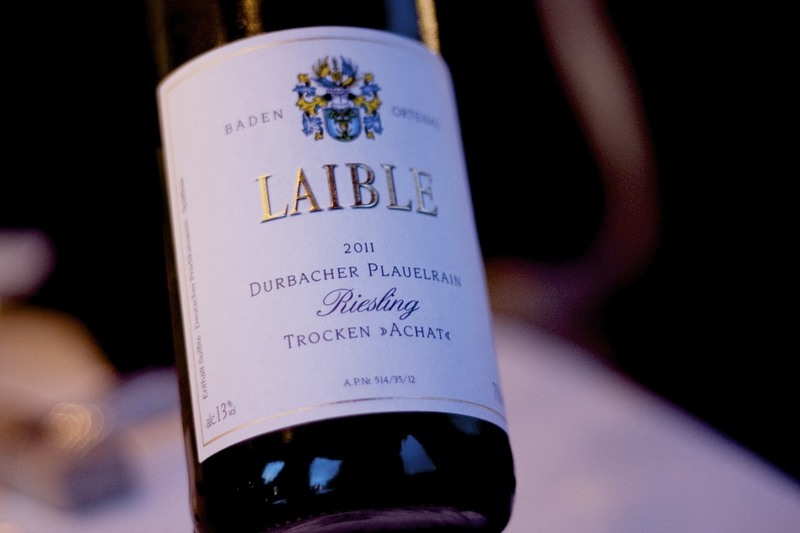 How could we turn it down after he boldly declared that this was the best German sauvignon blanc? We were indeed surprised with the minerality and juicy aroma of elderberries, ripe gooseberries and roasted hazelnut emanating from this bottle. Touché indeed Mr Sommelier! 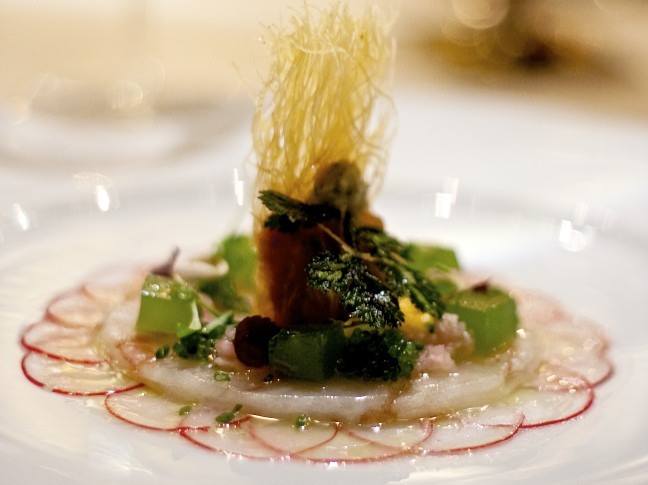 Another beautiful course of Carpaccio of wild gamba, crispy seafood, tobiko, cucumber and affila cress, served on a bed of sliced radish, decorated with cucumber jelly. The dish was finished with some dried fragrant shiso and young sprouts sprinkled on top. 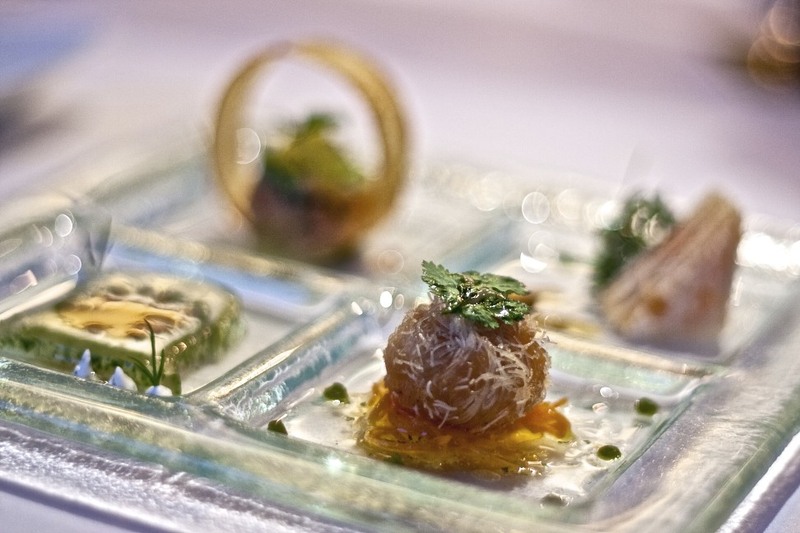 The tobiko egg brought a textural variation to the meaty gamba which released bags of flavour on each bite, and you could pick out a tiny bit of heat from sweet ginger. The warm crispy seafood was made with kataifi wrapped around prawn and fish paste with spices of the Middle East. It was a great dish that truly captured Wohlfahrt’s refined techniques, and more importantly all the elements worked well together in terms of temperature, texture, flavour and fragrance. Now I’ve tried foie gras on countless opportunities and thought it would be very difficult to create something as unique as the Magnum from Osteria Francescana but I must admit Wohlfahrt surprised me with his Truffled goose liver raviolo, two kinds of parsley and truffle sauce. It contained two of my favourite ingredients, and before you say anything, no, I’m not talking about parsley! 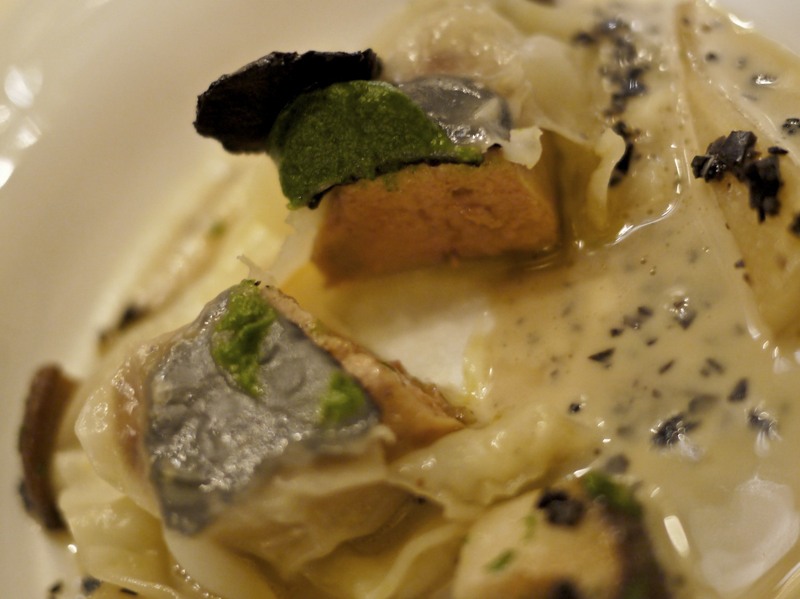 The raviolo was stuffed with foie gras and oyster mushroom with parsley purée, carefully laid on a bed of parsnip roots dressed with a generous amount of an intense earthy mushroom sauce at the table with shavings of Perigord truffle. The foie gras was cooked to perfection and the pasta was the right thickness. I did however think that the oyster mushroom was the star component of the dish. Following a long absence, the Soufflé of quails egg, asparagus, morrels, pea puree and green sauce made it back on to the menu since a couple of years due to popularity. We were glad the chef caved in to his diners demand. The quail egg white was beaten separately and the egg yolk was dropped in the middle before making a soufflé which essentially poached the yolk. The fresh parsley sauce melded the sweet pea purée and the soufflé, and what better than asparagus to go with egg? It was fresh, light and refined. The icing on the cake was the slight nuttiness and earthiness from morrels. 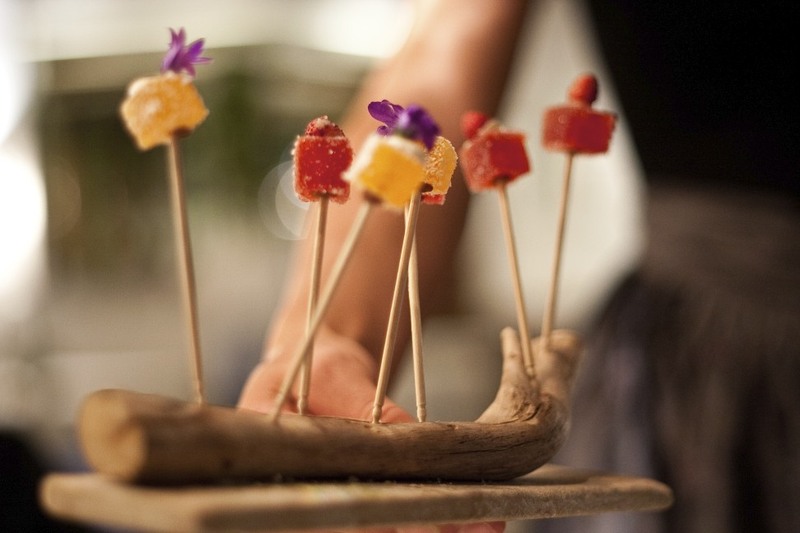 With skills like this I could see why Wohlfahrt was offering a vegetarian tasting menu. I could easily have had another plate of this! On to my favourite course of the evening with the Sea bass, brandade, watercress, lemon and champagne butter. This was just one of those cases where the photo couldn’t do justice to the dish. 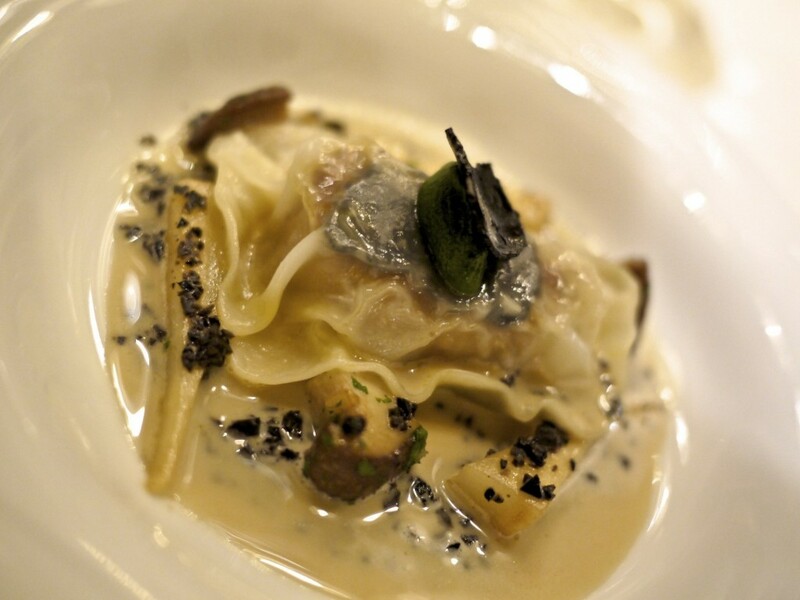 There was so much going on in this dish and one fault could have been fatal – but it was remarkably well executed. Forming the base of the dish was a bed of sweet watercress purée which had been beaten with olive oil. 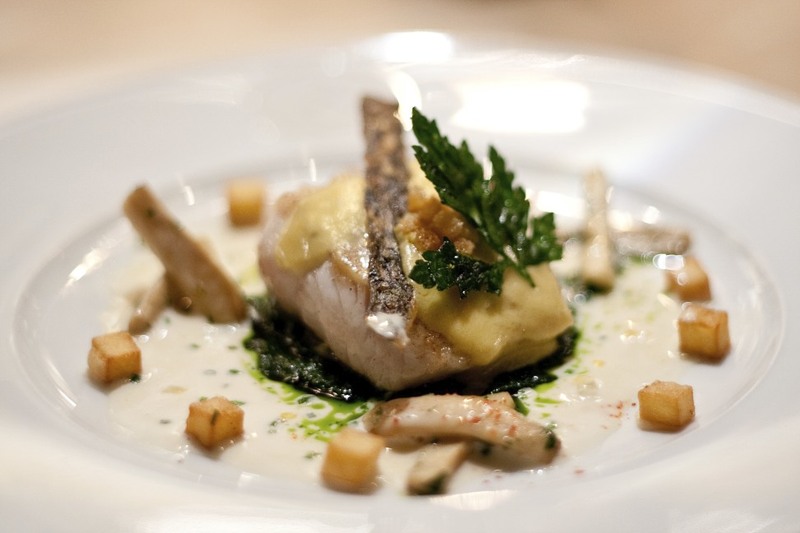 A sea bass mousse was blended with potato to make a brandade, and the fish was coated with a reduction of fish foam with butter, lemon juice and zest. The brittle seabass skin and crispy potato cubes were vital for some textural contrast in the dish. In true classic French cuisine style, the rich creamy sauce made from fish foam, champagne butter and chives was served at the table to ensure the right temperature. What I particularly enjoyed about the dish was the balance of lemon-to-butter in the dish. My previous experience with similar dishes have always resulted in my palate being dominated by the zingy citrus flavour. Suffice to say, the fish was cooked perfectly but I think each element to this dish was as important as the other. 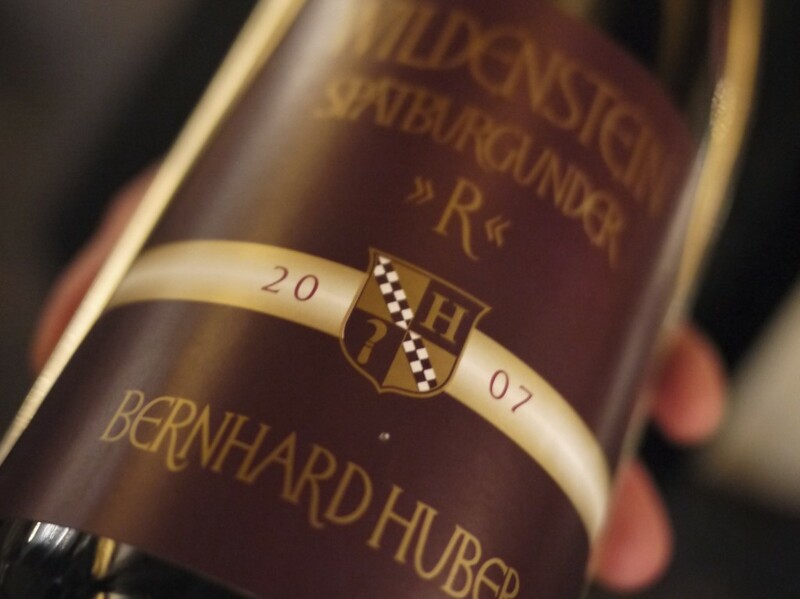 The next wine which our sommelier decantered for us was one of Bernard Huber’s flagship pinot noir, Bernard Huber Wildenstein Spatburgunder ‘R’ 2007, which had an intense red and black fruit on the palate with a massive structure and very fine tannins. 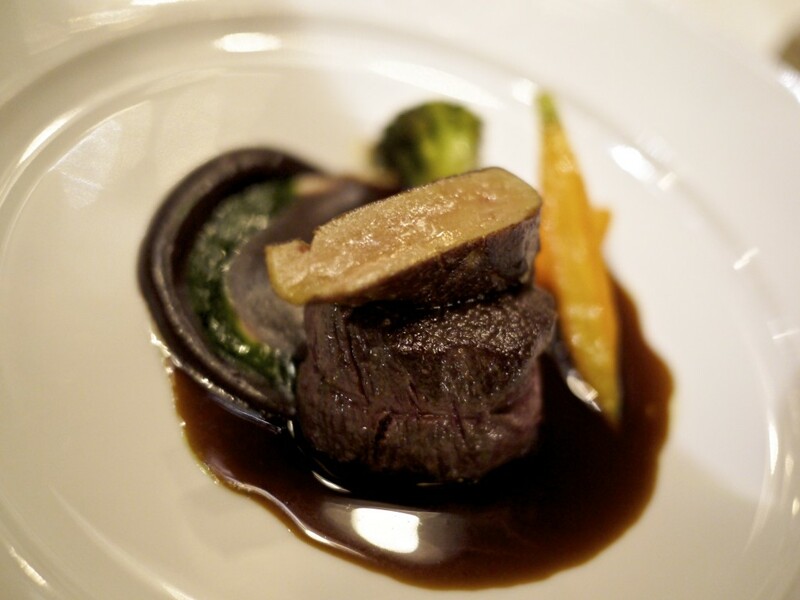 … a Medallion of venison, carrot-ginger purée and cardamom jus. We were served the first venison of the season with a duck liver slice, a venison innards mousse made in equal ratio with crème fraîche, and a carrot and ginger purée, with broccoli and polenta on the side. The venison was served pink and innards mousse was delicious as it was not dominant in the overall flavour of the dish. The polenta with a hint of rosemary was great to mop up the venison jus that had a subtle flavour of cardamom. The sweetness of the carrot went well with the gamey meat but I felt extremely full at this point and could not appreciate the last few mouthfuls. Shame! I couldn’t look at cheese at this point but as my friend duly pointed out, it would be a crime to turn down a plate of cheese from Bernard Antony. I caved into peer pressure after a couple of minutes of um-ing and resorted to just getting a handful of hard cheeses and nothing too rich and creamy. Suffice to say, they were as good as always. Thank god it was time for dessert! As usual, we were the last ones in the restaurant at this point as it was fast approaching 1am. The first dessert served was a Rhubarb and elderberry soup, violet, pine resin, thyme and herbal ice. The caramel sugarwork was made from violet and ice cream from Mediterranean herbs. On the side of the plate were raspberry cream, violet, elderflower and aniseed. I liked most of the components on this dish except for the violet. The last time I had violet in my dessert was at Gordon Ramsey’s three starred restaurant in London and the dish made me gag as it tasted like potpourri. In this case, I was able to isolate the violet from the dish and I thought the dish worked well without it. Perhaps some verbena would have worked better as a substitution? 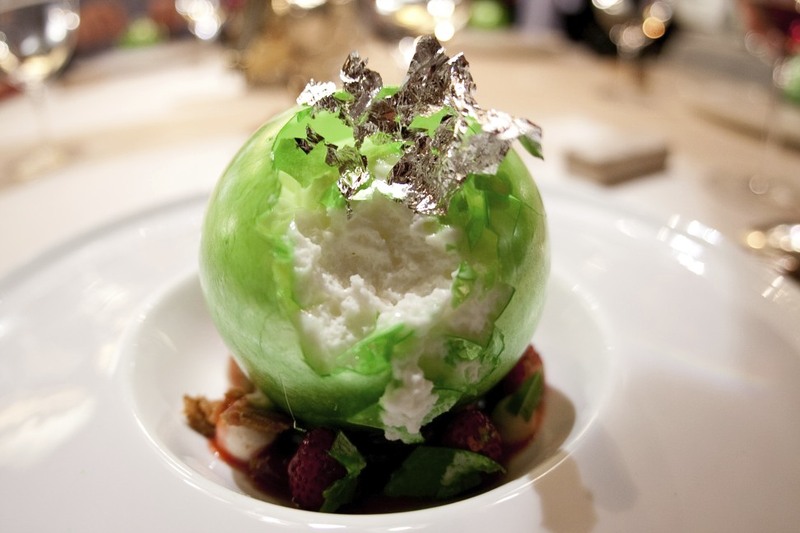 Last up was an impressive sphere of Kir imperial: Woodruff-champagne snow and wild strawberry sorbet. As I cracked open the sugarwork globe I could see the strawberry sorbet, woodruff flavoured champagne mousse and milk chocolate foam. For those who are unfamiliar with woodruff, it is a herbaceous perennial plant that is commonly used in Germany, particularly around spring time and has a very unique fragrance and flavour, the closest being vanilla. Underneath the sphere were some macerated wild strawberries oozing with sweetness. It was exactly what I wanted – a very fresh and light finish to the meal. Bravo. 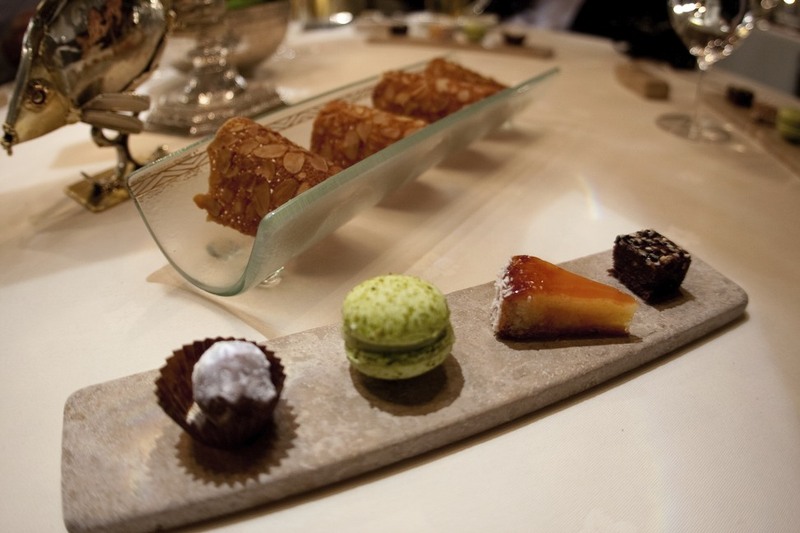 We made a concerted effort to try one of the petit fours each consisting of a nut biscuit, chocolate brownie with sesame, passion fruit tart with orange and coconut, pistachio macaroon and finally a chocolate dusted with sugar with Armagnac inside. 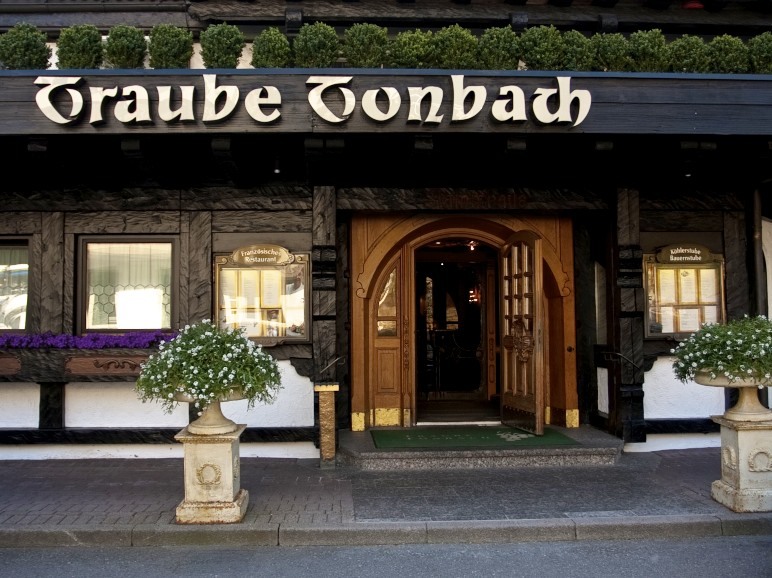 As expected from a restaurant of this calibre in Germany, the service was slick and impeccable. Each course and wine came with an explanation and no questions remained unanswered. I also noticed that other than our table, all the other diners were regulars who had been returning for many years. And why wouldn’t they? 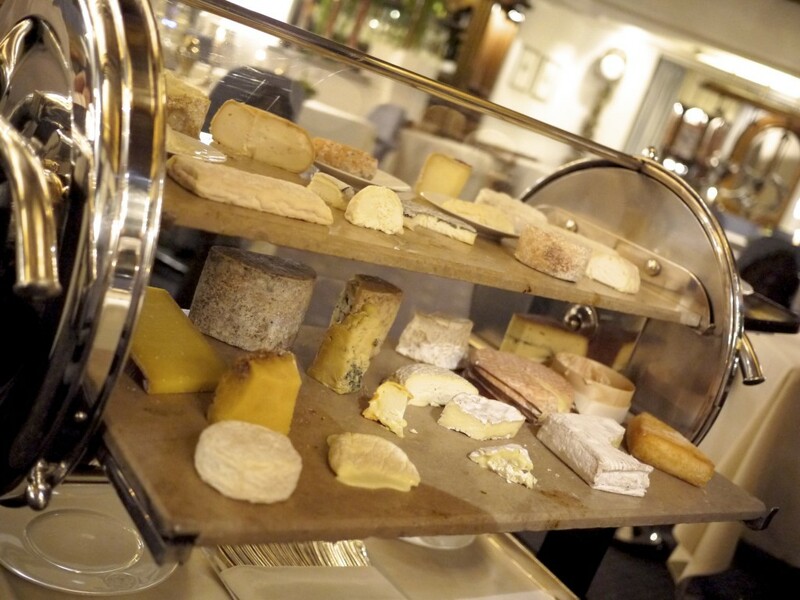 At just under 200 euros for a full tasting menu (drinks excluded although the average price for wine was very modest), the food served here punched well above the weight compared to many other three-Michellin starred restaurants, including a handful of classic restaurants in France. 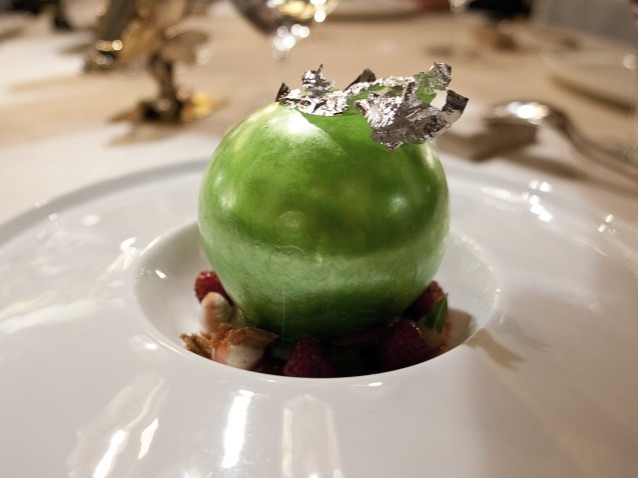 At a time when many young chef’s have looked towards a more modern and minimalist approach to fine dining, Wohlfahrt’s unwavering determination in twisting classic French techniques and incorporating German produces is admirable. 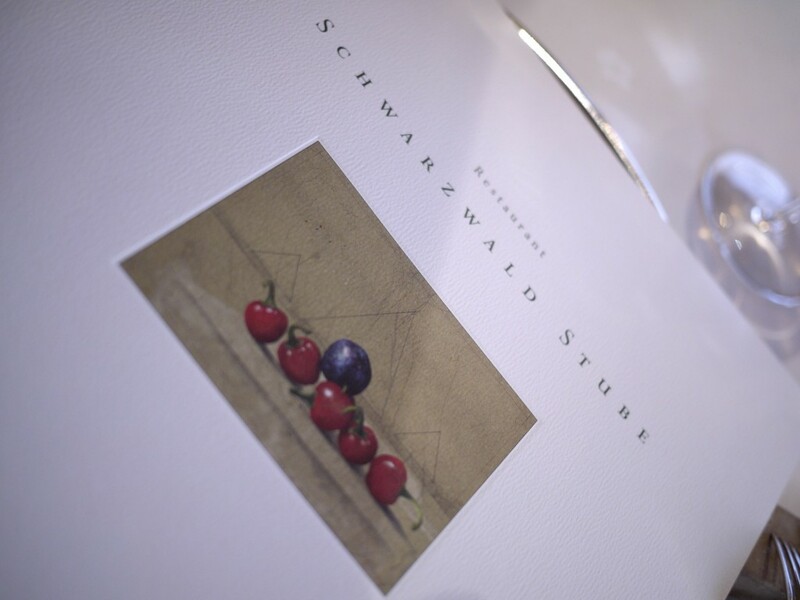 Most importantly, it has given Schwarzwaldstube a unique identity that distinguishes itself from the rest of the pack. One word of advice though if you decide to come here – leave plenty of space in your stomach because you will definitely be well fed! 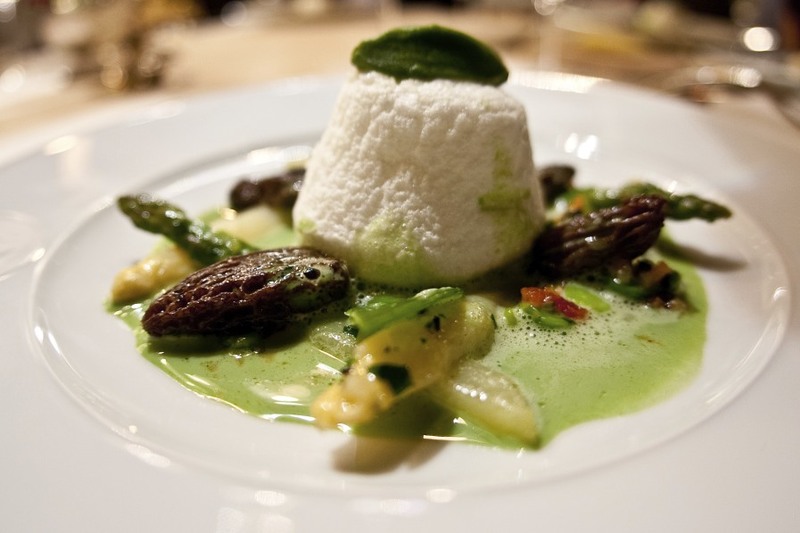 I’d definitely come back with my wife on our next trip to Europe to try the vegetarian tasting menu, and trust me, I can’t believe I just said that! This entry was posted in Europe, Germany and tagged Black Forest, Harald Wohlfahrt, Heiner Finkbeiner, Peter Zimmermann, Pierre Lingelser, Schwarzwaldstube, Traube-Tonbach on May 29, 2013 by admin.